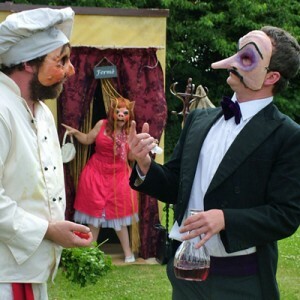 Aqueous Humour is a darkly comic physical theatre company run by director & performer, Tom Hogan, and designer & artist, Nerissa Cargill Thompson who have over 20 years’ experience of creating interactive and traditional theatre. Founded in 2001 in partnership with The Lowry, our shows have toured nationally including: Manchester Commonwealth Games, Edinburgh Hogmanay, Streets Ahead, Manchester Pride, London Zoo, London South Bank, MintFest and Streets of Brighton. “Absolutely fabulous, left me wanting to see more” – Leamington Spa food & drink festival. To make ridiculous, anarchic original comedy to attract new and young audiences. To create high quality comedy performance to develop the vision of the company. To share the work we create with the widest possible audience specifically focusing on bringing new audiences to live performance. Deliver excellent opportunities for new and emerging talent in professional and community settings. Our Midnight Walk was definitely livened up this year by the Skymuffins. Everyone who came into contact with them enjoyed it, thought they were really funny and had a good laugh.